The Morgana DigiBook 150 is the perfect entry level binding machine. The DigiBook 150 is an entry level PUR binder(perfect binding machine) and is ideally suited to traditional and digital printers who require short runs of PUR perfect bound books to a professional standard. 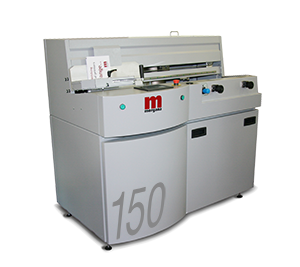 The DigiBook 150 is equipped with a patented closed gluing system where the spine and side gluing is applied by a slot applicator for the utmost binding quality and accuracy.